ecans are worth $220 million a year to Doña Ana County, according to New Mexico State University’s Doña Ana County Extension Agent Jeff Anderson. Because Georgia lost crops due to a hurricane last year and other trouble the year before, New Mexico is No. 1 in pecan production, and in Doña Ana County, there are 31,200 acres of pecan orchards. “Doña Ana is the largest agricultural county in the state,” Anderson said. “Outside of dairy and cattle, pecans are the largest market (in New Mexico).” Anderson said pecans make a huge economic impact here. In addition to sending pecans to markets outside of the state, they are a draw for tourism, and there are all kinds of secondary products that come from the industry. So, while pecans use about 60 inches of water per tree, Anderson said the economic significance makes the water use an arguable point. “The water is going by in the river,” he said. “It can go right on by or we could use it.” Before there were people in the Mesilla Valley, the river would flood across the valley, Anderson said. So, while people may think flooding (the trees) is bad, it recharges the valley’s aquifer by spreading the water out. “If it stays in the river, it stays in that area,” he said. “But if you spread it out, it actually recharges the aquifer.” Anderson said pecans came to the Mesilla Valley around the turn of the previous century when Fabián García started experimenting with different nut crops. The Stahmann family picked up on the pecan business in the 1930s and made it a local industry. They now farm about 3,200 acres of pecans. ability for farmers per acre-inch of water applied. “All aspects of water use affect agricultural efficiency, profitability and human health,” she said. Goldberg also talked about the health benefits of pecans and research being done in the area of nutrition and food science. “Pecans have numerous health benefits,” she said. 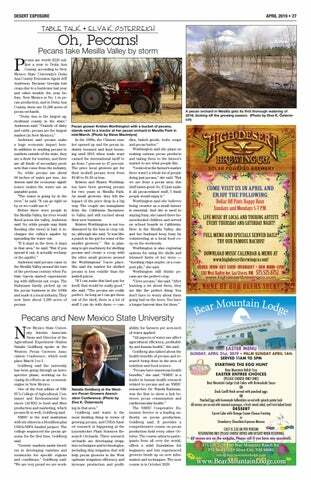 “NMSU is a leader in human health research related to pecans and an NMSU researcher, Dr. Wanda Eastman, was the first to show a link between pecan consumption and cardiovascular health.” The NMSU Cooperative Extension Service is a leading authority on pecan production, Goldberg said. It provides a comprehensive course on pecan production held every other October. The course attracts participants from all over the world, offers a solid foundation for beginners and lets experienced growers brush up on new information and techniques. The next course is in October 2020. COME VISIT US IN APRIL AND ENJOY THE FOLLOWING: Dollar Off Pints Happy Hour Sundays and Mondays 5-7 P.M. LIVE MUSIC BY LOCAL AND TOURING ARTISTS EVERY THURSDAY AND SATURDAY NIGHT! FULL MENU AND SPECIALS SERVED DAILY! TRY OUR FAMOUS NACHOS! DOWNLOAD MUSIC CALENDAR & MENU AT www.highdesertbrewingco.com! SUNDAY, APRIL 21st, 2019 • PALM SUNDAY APRIL 14th SERVED 11AM TO 5PM STARTING THE EGG HUNT Bear Mountain Relish Tray EASTER ENTREE CHOICES (PLEASE CHOOSE ONLY ONE) Bear Mountain Lodge Crab Cakes with Remoulade Sauce OR Duck Conﬁt Hash served with poached eggs OR Poached Eggs with homemade hollandaise served with spinach potato hash All entrees are served with steamed asparagus, a fresh mixed salad, and fresh baked bread DESSERT Carrot Cake with Orange Cream Cheese Frosting or Strawberry Chocolate-Espresso Mousse COST IS $32.00 PER PERSON RESERVATION ONLY (PLEASE CHOOSE ENTREE AND DESSERT WHEN RESERVING) All menus are on the website. Please call if you have any questions.